Normally, I’ve always suggested that you pack around a great travel outfit, and then a carefully selected travel capsule wardrobe of separates, chosen separately, all working together. But what if you decided to pack outfits? If you work from a unifying theme around which you choose all of your outfits, this is a very effective idea, which also has the benefit of helping you remember all of your important accessories! For this example, I’m packing for someone who LOVES the combination of blue and green, and who has a variety of clothes and accessories which reflect this. The trip starts somewhere relatively cool, but will include some warmer weather activities, and a dressy dinner for a special occasion. So how does this play out? Another day will require something casual – shorts, a tank top, a shirt that can shield you from the sun or the air-conditioning… Remember sunglasses, walking shoes that don’t look like marshmallows, and a snazzy green belt just because you can. Dont’ forget the evening out. This is where the benefit of thinking in outfits becomes really apparent – you can be certain that you don’t forget your great clutch bag, dressy earrings, satin shoes, and a bit of a wrap to shield from drafts. A simple tee and swishy skirt gives you an option of dressing up or down, and a sleeveless shirt with green pants are a perfect casual, warm day outfit. This is what you’ve got to pack; a travel capsule wardrobe that could see you through a very long vacation in consistent style, with lots of options! Handy stuff! I'll definitely be drawing on your ideas as I pack to a two week trip where I want lots of room in my suitcase to bring things back with me. Hooray! A packing post! It's really ridiculous how much I enjoy these. Thank you! You've really hit this one out of the park! My wardrobe tends to revolve around grey-denim-purple, or grey-black-red combinations, so this navy-and-green post really spoke to me. As usual, beautiful choice of solids, prints and textures. This is a great post Janice! So many ideas. 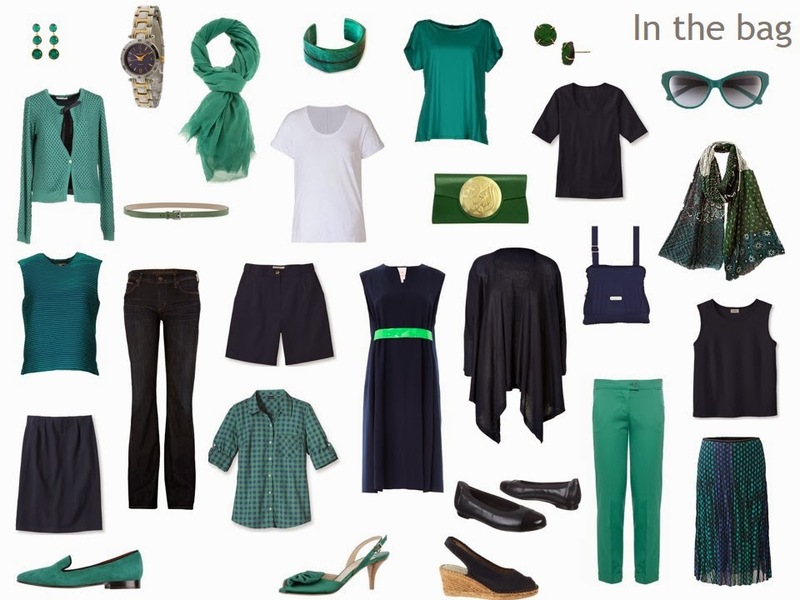 I almost wish I had a lot of navy and green in my closet! You read my mind, my clever friend Janice! I have been building up the navy in my wardrobe and I have lots of green too including a navy and green striped top similar to the one you've shown, a green satchel and green lace-up shoes. I've already packed for my next trip (flying today to London to see my family) but we are due to go away for my husband's birthday at the end of February,so this is very timely and inspiring for that trip! I am going on a two week trip to Spain in March. This helps a lot to transition from cool weather to warm. Thanks very much for your wonderful ideas. Lovely! I always enjoy these travel posts. Love the concepts and the refreshing color combination. I particularly like the 16 potential outfit options shown at the end. With your examples over the past couple of years I have learned to coordinate so well that with a few accessories and a total of 8 tops, 3 pairs of pants and 2 pairs of shoes as basics, I have had more outfits than I can wear on our typical 4 week trip. We wash clothes about once a week and my husband and I call it our "one week + one day" packing plan. Last April I was also able to pack a couple of outer layers (I wore my coat in transit). It all fit into my 22" spinner (I never check baggage unless the airline requires it) and the total weight was 20 pounds (including the underwear, foundation garments, socks, sleepwear and non-clothing sundries). The spinner weighs 6 pounds, so the total weight of everything that went in the bag was 16 pounds. When packing light, weight is as important as the size of the bag. You have to schlep the thing around yourself, up and down stairs, on cobblestone streets…, and if you fly on a small European airline, the weight limit is much lower than that for the international flight, even if you do check a bag. You're so right about the weight, Lo. So often you have to carry a case, and with even a little one, the weight can mean the difference between carefree, speedy journeys, and staggering about with a sore neck and/or back. When you factor in loading into taxis or cars, climbing on and off trains or buses, lifting on and off overhead racks, lugging up and down stairs in B&Bs without lifts, and as you mention over cobblestones, the weight is very important. You did very well indeed! The weight of a case, especially one with wheels is something we don't often think about. But there's always that choice: wheels for the long walks in airports and stations, or no wheels but an extra two or three kilos of clothes. Janice, I love this post – even though it's more than I would typically pack. Unless we drive, then "anything" goes! Lo – thanks for your 4-week plan. I'm just in the beginning stages of planning/thinking about a 2-month trip to (mostly) Germany next year. Love your approach! This is exactly how I pack so thank you for giving me permission! When I pack by outfits I remember each element. What I need to focus on though is a color family. Sometimes I just take outfits I want and like which absolutely leads to taking too much because items aren't repeated. I love to learn! I'm taking a one week trip to Texas next month and I'm definitely going to use your packing tips. And while I'm there, as good clothes are so much less expensive than in the UK, I will shop with purpose and not randomly! If you would like a challenge I would love your suggestions for a week's visit to Seattle in September, to include a rehearsal dinner outfit and a wedding outfit. Your posts have really influenced me. This fall and winter, I have eliminated the colors of brown/cream/ red/ yellow from my wardrobe, and I am concentrating on the colors that look good on me in the winter- purple, navy, grey and black. My question is what colors should I focus on in the summer? I LIKE olive, turquoise,orange, and brown. Could you possible do a capsule for me? I am a teacher, but I travel and serve on some committees so I do need appropriate summer clothes. Also, I live in Colorado, the CAPITAL of relaxed cool. Thanks so much. Love the packing posts! Love the outfits concept as well. Thanks! I'm reading today's post from Maui — we are here for a two week vacation and for the first time ever, both my husband and I packed everything we need in carry-on spinners. I could always pack for business travel in a carry-on but when it came to vacation, I found I always wanted to take favourite items (that didn't go with anything else but would look so darn cute, you know the drill…) so of course I over-packed. BUT as I read this I'm reflecting on how ridiculously easy it was to pack for this trip. I took last summer's Project 333 wardrobe — white, navy, coral and turquoise — and edited it down to 16 pieces. (Plus bathing suits, I have to confess.) My only difficulty was applying discipline to keep the number of items down. But I kept returning to my favourite Janice packing posts, and made myself take things out of the case. Of course now that I'm living with the wardrobe, half way through our trip, I realize I could have packed even fewer things! Thank you, thank you, Janice! Just came back from a week of travel with black, camel and red. I always felt put together and comfortable. When I got home and unpacked I discovered a sweater and 2 shirts that had gone unworn!! I took 4 pairs of pants, 3 sweaters, 3 pairs of shoes and 6 shirts plus scarves, jewelry and one work-out outfit. This handled 4 client meetings, golf, museum, evenings out, hikes,movie etc. Janice, your thinking is starting to sink in! I stuck the extra 2 shirts and sweater into my suitcase "just in case". Perhaps next time I will have the courage to pack even lighter! Janice, this is sensational! It's an excellent idea and you've illustrated beautifully with this fresh colour combination. I'm also thinking that this principle would work well for constructing an 'at home' wardrobe – even just one more basic outfit and I can see it working for the six-month seasons we have in Tasmania (warmish from December to April, and coolish to cold from May to November). I keep learning so much from your blog, I'm very grateful. What fun! And as I read through the comments, I'm picturing all these well-styled women, easily toting their own bags, confident, happy, and gorgeous!! What a lovely picture to start the week!